"And history becomes legend and legend becomes history. " The Legend of Bloody Mary is perhaps one of the most popular famous urban legends of the world. The introduction of this witch occurred in Western based folklore. There are many different variations of this particular story that are in circulation today. The most common version informs individuals that if they were to say “Bloody Mary” while standing in front of a mirror three different times the angry spirit of this spirit will show herself and could cause harm upon the one that summoned her. In other variations of the famous urban legend, those that wish to conjure this angry ghost must say “Bloody Mary, I killed your baby” a minimum of three times. Regardless of which “rules” apply, the legend of Bloody Mary is one that has intrigued individuals all throughout history. Many individuals do not realize that there are historical notations of Bloody Mary that involve the life that she led. It has been told that this lady resided deep within a dark forest in seclusion. She had a quaint cottage where she created a multitude of remedies that were created from the herbs around her home. This is how she made a living – by selling the remedies to individuals within her community and to those that lived in neighboring communities. In many instances, travelers to the area and even doctors would purchase the medicines that she created. As time progressed, many became fearful of Mary. The townspeople believed that she was a witch and delved into the occult and various types of dark arts. Eventually, rumors circulated about the evil person that Mary was and individuals kept their distance from her – scared of the terrible curses and evil that she may bestow upon them. As time progressed, the isolation that Mary experienced became more and more real. Then, a report of a missing girl was put out. The people from the community searched and searched for the child to no avail. Many of the people in the community started pointing their fingers at Mary. Time marched forward and the child was not found. In the midst of all the search efforts, many small girls eventually came up missing. Eventually, the people in the community knocked on Mary’s door. She was interviewed and was asked if she knew where the children could be. Naturally, Mary expressed the fact that she did not have any facts pertaining to any of the missing girl reports and denied the fact that she had any hand in the disappearances. There was something odd noted, though. She looked different to the people of the community – even younger. This immediately drew suspicion. Then, one night a small girl got out of bed and did something very unusual. She walked outside towards where Mary stood projecting a spell upon her. Her mother, who was typically in bed at that time, just happened to be awake tending to a complication associated with her tooth and observed her daughter exiting the home. The mother called for the girl’s father and he ran out behind her, and made sure that he had his shotgun. Despite the attempts to stop the child or restrain her from walking into danger, she fought and continued on the original path that she set out on. Neighbors eventually heard the commotion and came to the assistance of the girl’s parents – it was then that they observed something very strange, very unusual. As they looked toward the deep forest where the child continued to walk to, they observed an unexplainable light. The people approached the light with caution. As they got closer, they discovered the figure of Mary standing beside an old and relatively large tree. It is said that she was holding a carved wand up toward the child that was approaching her. The witnesses to this stated that she glowed. The light that was emitted from Mary’s body was considered to be both unearthly and evil all at once. Naturally, the people charged her. Now that their suspicion of her being a witch was confirmed, they went in for a full assault. She ran toward safety to get away from the villagers. The father of the small girl took aim at Mary with a shotgun and managed to strike her near the hip area. This resulted in the fall that got her caught. Once the villagers had Mary under their control, they carried her to a spacious field. Several built a large fire. They then constructed a quick stake structure. In those days, it was believed to be an appropriate measure to burn an individual at the stake if they were considered to be evil witches. As Mary suffered through the torment of flames and heat, she yelled obscenities and curses towards the people that were watching. She vowed that if someone spoke her name while standing in front of a reflective surface such as a mirror that she would seek immediately revenge. Once Mary died at the stake, the people did a thorough investigation of her cottage and the land that surrounded her cottage. They wanted to locate any detail that they could find to locate all the missing children. It was then that a terrible discovery was made. She had created a miniature graveyard with unmarked graves. It was her that killed the children. Upon further investigation, it was discovered that she used the blood that was derived from each child in order to create a remedy that would allow her to be young and appear young. It was a traumatic and terrible loss for the community. The people of that village never forgot Mary and the evil that she brought upon their community. They continued to talk about the evil curses that Mary lashed out at them with while burning at the stake for practicing witchcraft. No one dared to tempt the evil of this witch. As time progressed, the villagers spread the story down from one generation to the next. 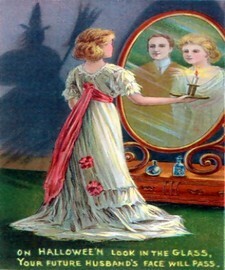 Today, it is believed that when Bloody Mary appears in a mirror, she will attack the person standing in front of it and will then drag their soul into the reflective glass – to be trapped forever. In famous urban legends, the story of Blood Mary is not only the most popular, but it is also considered to be one of the greatest unsolved mysteries of all time.